Less than a week before Election Day, Seattle mayoral candidate Jenny Durkan has about a 5-to-1 financial advantage over rival Cary Moon. 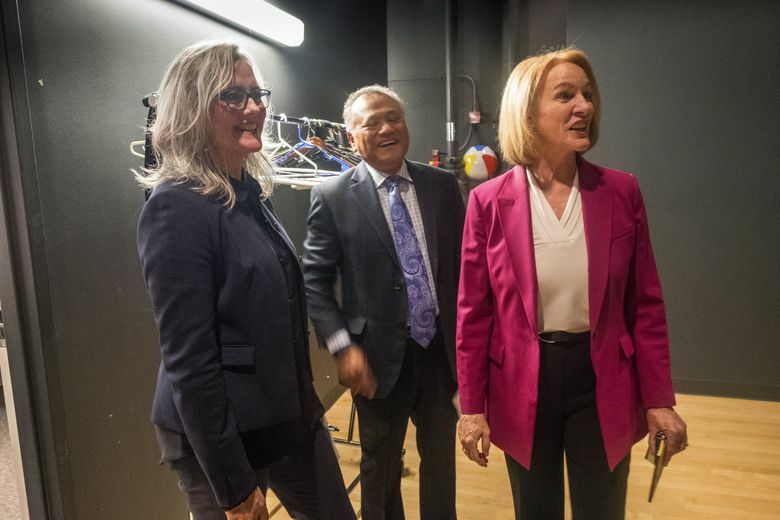 Jenny Durkan has attracted more donors than any mayoral candidate in Seattle history, raising more than $900,000, while also benefiting from a record-setting independent-expenditure campaign funded by business and labor. It all adds up to roughly a 5-to-1 financial advantage for Durkan and her allies over rival candidate Cary Moon, one week from the Nov. 7 election. As of Tuesday, Durkan’s campaign had raised more than $937,000 from 3,963 individual contributors, according to filings with the Seattle Ethics and Elections Commission (SEEC). More people have given to her mayoral election effort than any on record, surpassing the 3,911 donors to Greg Nickels’ 2001 campaign, according to the SEEC. A former U.S. attorney and well-connected Democratic power player, Durkan could be on a pace to become the first Seattle mayoral candidate to pass the $1 million mark. (When adjusted for inflation, however, the $730,000 raised during Mark Sidran’s mayoral bid in 2001 would surpass $1 million in today’s dollars.) Thirty percent of Durkan’s donations have come from outside of Seattle. Moon, a waterfront activist and urban designer, has collected about $347,000 ­– including $176,000 of her own money ­– from 972 donors, according to the latest filings. She has the fewest contributors to a general-election Seattle mayoral contender since Al Runte, who had just 94 donors in his doomed 2005 challenge of then-Mayor Nickels. Eight percent of Moon’s donors live outside the city. Durkan’s money advantage looms even larger when taking into account the independent spending effort on her behalf. While donations to candidate campaigns in Seattle are limited to $500 per person, independent-expenditure committees can raise and spend unlimited amounts. One such group, called People for Jenny Durkan, has raised more than $847,000 and spent $733,000 so far, largely on web and TV ads, and mailers. Most of the money for that effort has come via the political arm of the Seattle Metropolitan Chamber of Commerce, whose biggest donors include Amazon, Comcast and Vulcan. That pro-Durkan effort dwarfs the previous independent-spending record for a mayoral race – more than $500,000 in 2013. That year, groups supporting Ed Murray spent more than $310,000, while groups backing then-incumbent Mayor Mike McGinn spent $241,000. A pro-Moon independent expenditure group, People for Cary Moon, has raised $27,500 for Internet advertising, according to SEEC reports.